Pressing tofu gives it a meatier texture, and when followed by chargrilled crust, well, it’s a combination that’s hard to pass up—especially when it’s slathered by a tangy homemade barbecue sauce. If you like your barbecue sauce really sweet, add additional maple syrup to taste. Heat the oil over medium-high heat in a shallow saucepan with a lid. Add the onion and cook until it begins to soften, about 4 minutes. Add the garlic and continue to cook for an additional minute. Add the rhubarb, orange juice, tomato paste, maple syrup, tamari, yellow mustard, chili powder. Mix well, cover, and simmer, about 10 minutes, until rhubarb is softened. Use a handblender to puree until smooth, or transfer the mixture or a heat-safe blender or food processor and process until smooth. Taste for seasoning—depending on your brand of tamari, soy sauce, or coconut aminos, you may want to add a pinch of salt. Put the tofu in a shallow baking dish and cover with the sauce (you may have some leftover). Marinate for at least 3 hours. Preheat a grill to 400F. Generously oil the barbeque grate. 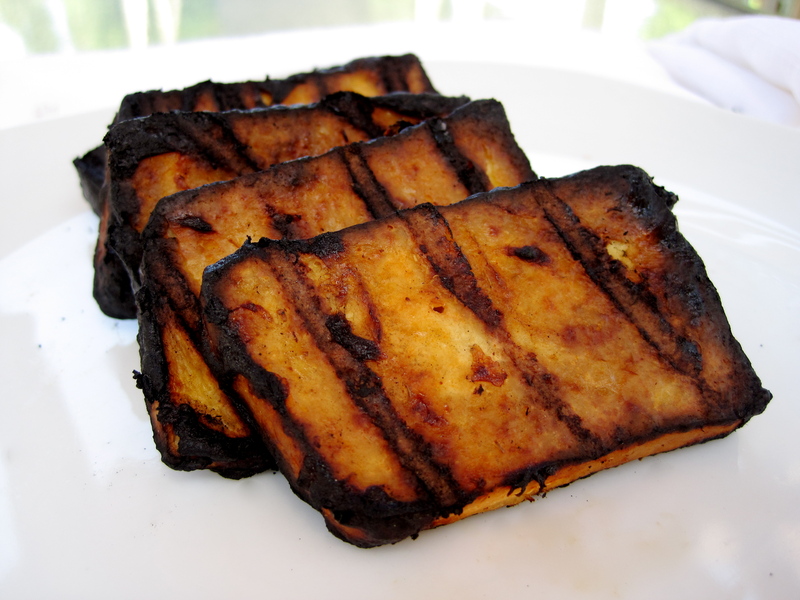 Put the tofu on the grate and grill for about 5 to 7 minutes (flipping it too early will cause it to stick). Transfer it to a plate, re-oil the grate, and grill on the other side for an additional 5 to 7 minutes. Serve warm, either on its own or in a sandwich, with additional sauce if desired. Thanks! I think I made that last summer? I found it in my archives and thought it was timely! I am checking out that link right now, Kimmy! Thanks for thinking of me. And yes, I owe you an email and I am so swamped I promise it is coming soon! Thanks! To make it soy-free (for you), you could easily put that sauce on everything!